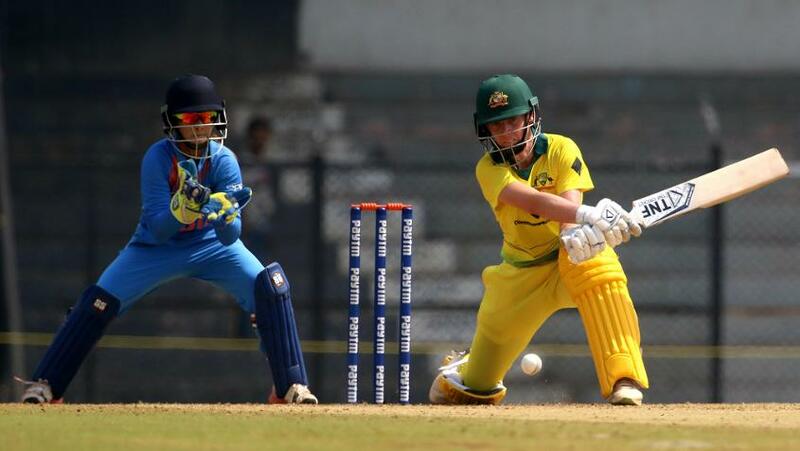 Jemimah Rodrigues the lone bright spot in Indian effort as Australia win by 36 runs. Beth Mooney and Elyse Villani struck solid half-centuries to take their side to a formidable 186/5 before Megan Schutt broke the back of the Indian batting by claiming an early hat-trick, the first by an Australian in women’s Twenty20 Internationals, as the visitors romped to a 36-run win in the fourth match of the T20I tri-series. Chasing 187 for a win at Brabourne Stadium in Mumbai on Monday 26 March, India could only manage 150/5 from their 20 overs to fall well short of the target. The result also meant the end of the road for India as far as the tournament is concerned as they have now lost all three of their games, while Australia and England have both won two apiece. India got off to the worst possible start with Schutt castling Smriti Mandhana and Mithali Raj off the last two deliveries of her first over, before returning to account for Deepti Sharma in her next over to complete the hat-trick. That left India tottering at 26/3 in 4.1 overs. 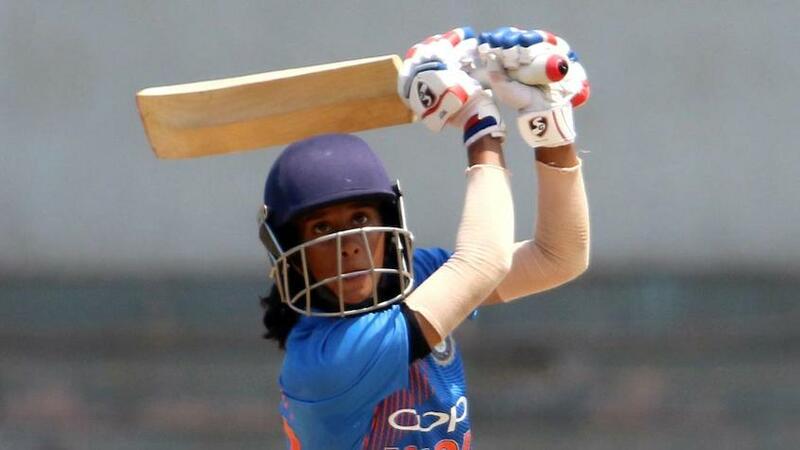 Harmanpreet Kaur joined Jemimah Rodrigues in the middle and the two added some stability to the innings by crafting a 54-run stand for the fourth wicket in a shade over eight overs. 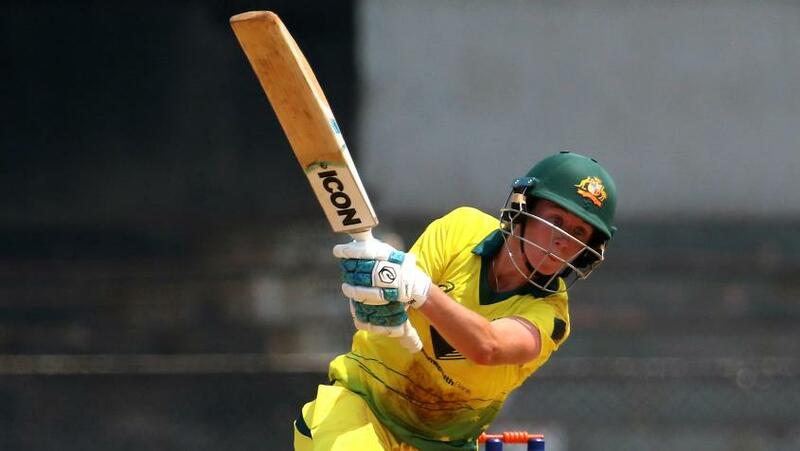 Rodrigues, scratchy at the start, soon found her feet as she carted the Australian bowlers to all corners of the park to bring up her maiden T20I half-century in just 39 deliveries. However, she fell soon after for 50 when she mistimed one off Delissa Kimmince straight into the hands of Schutt at mid-off. With the required rate climbing, Kaur struck a few lusty blows before perishing in the 14th over by top edging Ashleigh Gardner to deep mid-wicket for a 33-ball 30 to leave the scoreboard reading 97/5. Anuja Patil (38*) and Pooja Vastrakar (19*) tried their best to get close to the target but the failures of the top-order batters meant too much was left for the lower order. Earlier, Mooney and Villani forged a stellar 114-run stand for the third wicket to propel Australia to a formidable total. Opting to field first, India got off to an excellent start with Vastrakar getting rid of Alyssa Healy and Gardner in quick succession. At 29/2 after four overs, Australia needed someone to calm the proceedings down. Mooney and Villani got together and ensured that despite the initial fall of wickets the run scoring did not drop down alarmingly. They took their time to settle down but also did not let any opportunity to score go. Mooney aced three fours off Sharma’s first over while Villani smashed Radha Yadav for two fours of her own as Australia reached 84/2 after 10 overs to get on top of proceedings. Villani soon raised her half-century, her 10th in T20Is, bludgeoning Jhulan Goswami through the covers in the 15th over, and celebrated by thrashing the next two deliveries to the boundary as well. Mooney, not far behind, reached her second T20I half-century in the very over, taking 35 balls to reach the landmark. Villani, however, could not carry for much longer, with Poonam Yadav claiming the Australian No.4 for 61. She struck 10 fours in her 42-ball knock. Mooney cracked eight boundaries on her way to a 46-ball 71 before holing out to Rodrigues off Goswami. But, by that time, Australia had already reached a formidable 173/4, and though Ellyse Perry fell in the final over, Australia still got to a match-winning score. The next match in the series will be contested between Australia and England on Wednesday 28 March.